Environment: Formed from post-mining leaching and oxidation of V-U oxide-replacement assemblage developed at the expense of organic material. Pascoite group. 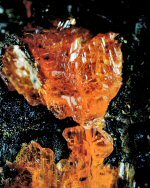 Comments: Intergrowth of orange magnesiopascoite crystals on V-U oxide replacement of organic material. CanMin v46:. Location: Blue Cap mine, near La Sal, San Juan County, Utah, U.S.A.. Scale: Crystal size 2.2mm across. Optical Data: Biaxial (-), a=1.769, b=1.802, g=1.807, bire=0.0380, 2V(Calc)=40, 2V(Meas)=45. Dispersion r < v crossed. note: Specific Gravity of Magnesiopascoite =2.43 gm/cc. U=PEMagnesiopascoite x rElectron Density= 19.08 barns/cc.